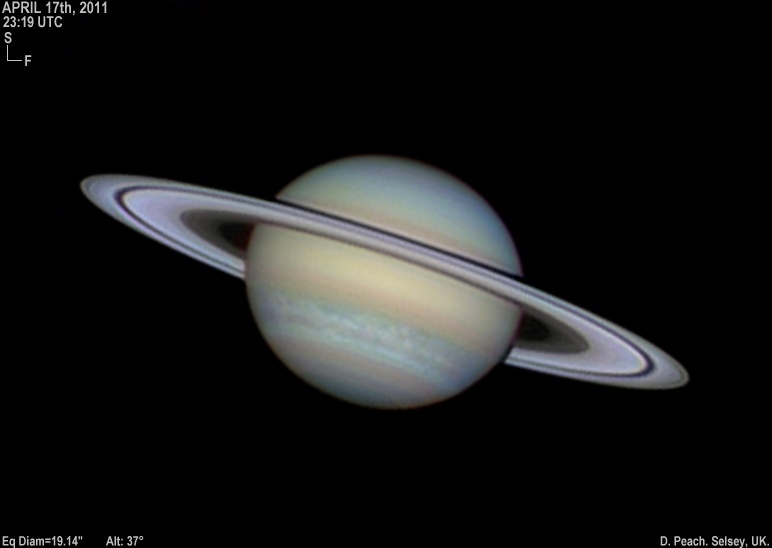 About 24 hours from now - around 0:00 UTC on April 4 - Saturn reaches the opposition point to the Sun: several effects conspire now to brighten the rings, and some observers claim the phenomenon is already detectable. Some recent amateur observations of March 30, 25, 23, 22, 21/22 (with spokes), 21 and 20, plus a mid-March Hubble image with more storm detail. • Other sky sky highlights in April include Uranus' crossing of the celestial equator - but this is purely academic as the planet cannot be observed right now. And the visibility of all planets except Saturn is very poor to non-existent this month. 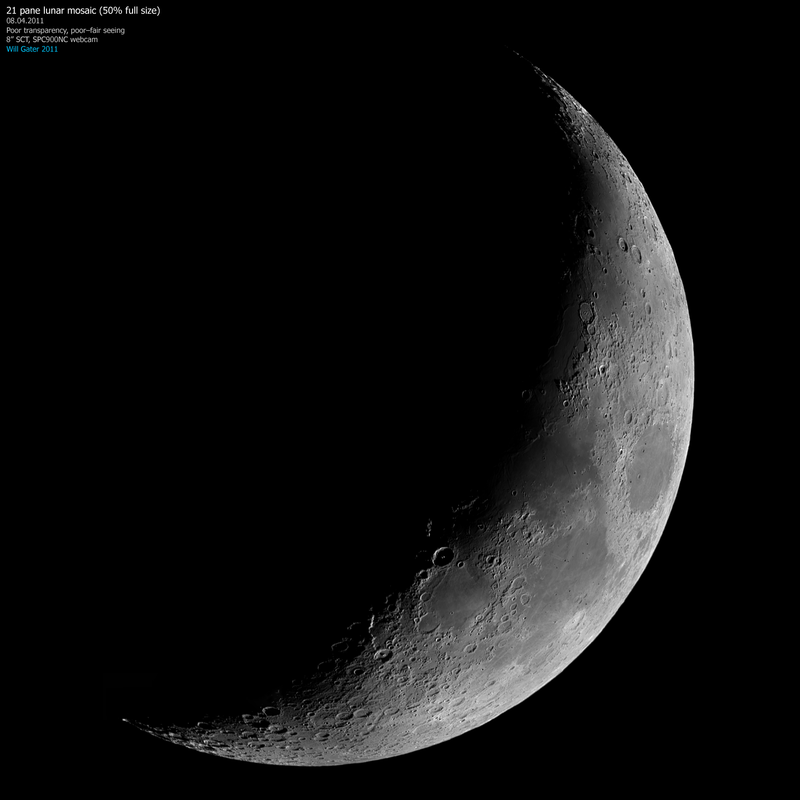 There is another opportunity to observe a pretty young lunar crescent on April 4 for Northern hemispherians, however. A look back at Mercury (and Jupiter) low at dusk on March 23 (Germany), March 22 (AZ and Austria), March 19 (Germany: Cologne and herten and March 16 (Sweden), plus a note on Jupiter's SEB return. • Lots of fine pictures of the March 19 perigee full moon are linked here, some collections included. In small bodies news an analysis of Elenin (still mildly optimistic for fall) and a March 25 picture, some jets of 29P in outburst, new comet C/2011 F1 (LINEAR), a funny paper on the Holmes outburst, a serious paper on the Scheila outburst, a bolide on March 23 (more), a claim of more fireballs in Northern spring and a call for observations regarding a possible Southern stream. From the Sun a nice March 27 H-Alpha mosaic, SDO action on March 24, various March pics, a claim that maxima are always double and a good solar April fools joke (more space-related jokes of note here, here, here, here, here, here, here, here, hier, here and here :-). • Some light intensity data from the 2009 TSE in India and a contemporary documentary (part 2 with the actual event) about TSE expeditions in 1973. Elsewhere in the Universe the brightening of Epsilon Aurigae has begun. • A deeep image of the Virgo cluster. • Excellent aurora videos from Norway have turned up on Vimeo here, here (background) and here, also great stills from Norway again and Finland (another trip report, a big panorama and an allsky series). • A fine green flash and another one through a tree. • And finally the ISS in front of the Sun in new images here (with spots), here and here.